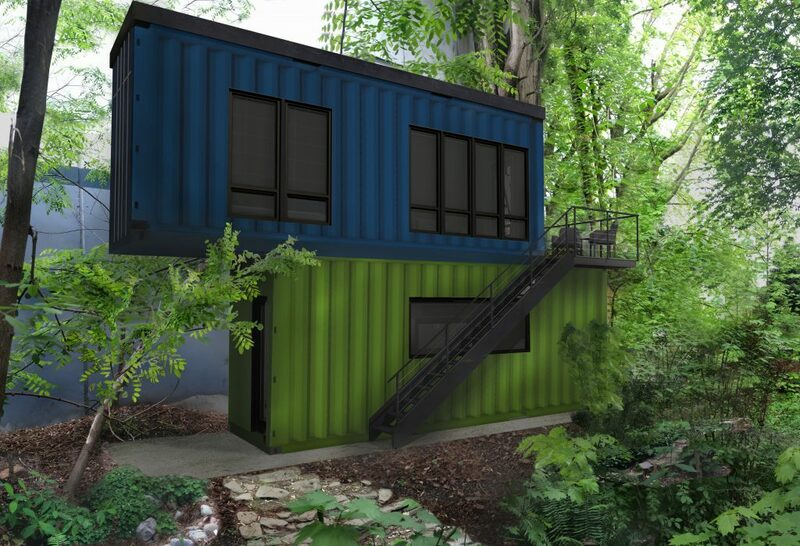 Two shipping containers are getting a new life in Georgetown – as a backyard office for our busy client! This project has been a long time coming, but it didn’t originally start out as a container structure. We first studied it as a garage remodel, but seismically unstable soil conditions prevented following through on this approach. We needed something that was intrinsically sound. This project is driven by material reuse, living small, and building green. There exists a backyard garage/shed original to the 1928 house that the “remodel” scheme originally looked at building over with a timber “exo-skeleton”, and a “new” scheme replaced it entirely. But we needed to find a more economical, resourceful, geotechnically-stable, and environmentally-friendly option, and shipping containers hit the mark! Without the need for siding, roofing, or structure, this project saves three large budget numbers right off the bat; it even comes with flooring if you purchase a container in decent condition. We chose “one-trip” containers for this project so they weren’t new off the shelf, but haven’t been damaged by countless trips across the sea. Having justified our choice of “material”, the most difficult part of the project began: research. Shipping container building isn’t taught in a classroom or in a textbook, and it is still scarcely available online. We relied on the help of a few local experts to get us started. Cantilevering the containers turned out to be much simpler than we anticipated; we were presented with only a few sheets of engineering plans and a handful of details for the entire project. The shipping container supplier will complete all steel modifications on site, i.e. window openings, steel strengthening, etc. before the containers are delivered, and the interiors can even be pre-fabricated so that once on site, only assembly is required! 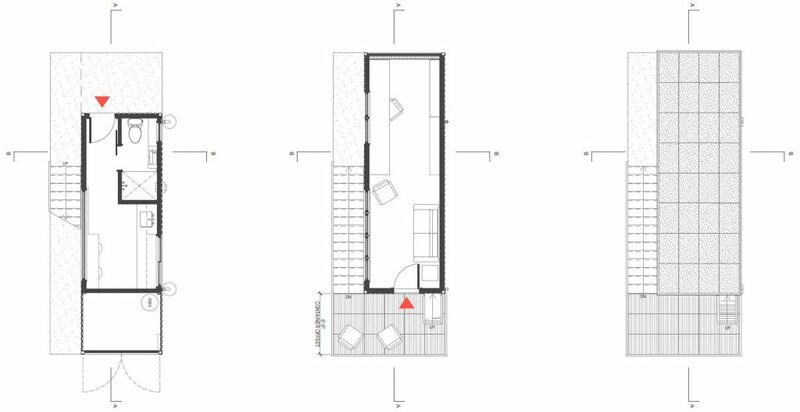 A particular aspect of this property did indeed make the planning more difficult, yet provided its own solution. Seattle’s Georgetown neighborhood is entirely within a liquefaction zone, meaning that during a seismic event the ground will liquefy and structures can be seriously compromised (Think: cars and homes halfway submerged in the ground after the soils re-solidify). All parties, including the city, wanted to make sure that life safety was guaranteed. The structural and geotechnical engineers designed a 18″ thick concrete mat slab that will effectively allow the structure to float relatively intact during any seismic activity. The fact that the shipping containers might once again “float” was not lost on us! Complete with a green roof, this backyard office will be a respite away from the working world, while also fitting in with the industrial aesthetics of the Georgetown neighborhood. In the lower container, a side door leads to a bathroom with a shower and a kitchenette with a view of the green urban jungle that our owner meticulously maintains in his backyard! The south side of the container will be an unheated storage space accessed by using the actual container doors. The upper container is accessed by an exterior stair and small deck. From the deck you can either climb to the upper roof deck to tend the gardens or enter the upper container: a full-length office space, surrounded by warm-toned birch ply walls. 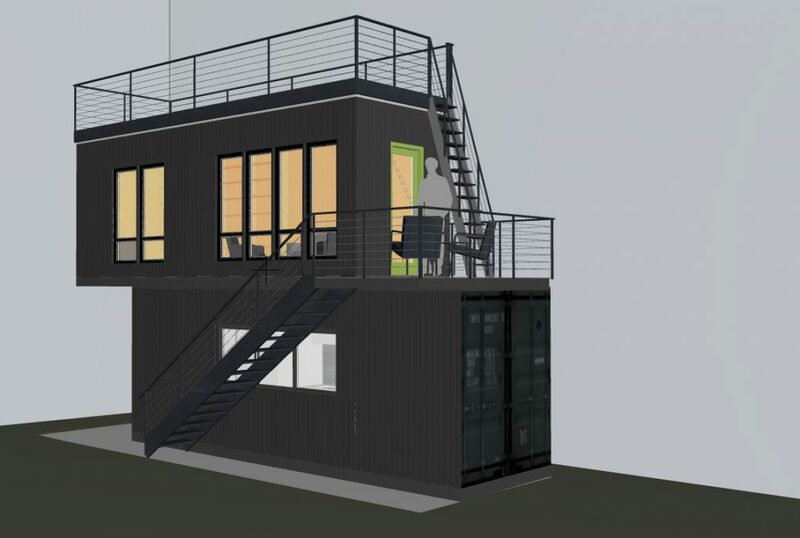 Not surprisingly, not every project has the need, desire, or property available to build a 2-story cantilevered shipping container in their backyard; we’re quite excited to see the final product! Stay tuned for photos as the project takes shape in the real world. Construction is expected to start February 2018. Looking for information on adding an additional structure to your property? Check out our Blog on DADUs, Backyard Cottages and Small Living in Seattle! Pingback: DADUs, Backyard Cottages, & Small Living in Seattle: Can you DADU too?